Dr. Rossi visits with Fr. Alexander Atty at Antiochian Village and discusses Fr. Alexander's cancer diagnosis and how he has dealt with it. Dr. Rossi reflects upon the meaning and significance of Psalm 6 in the light of his dear wife's suffering and death from bone cancer. 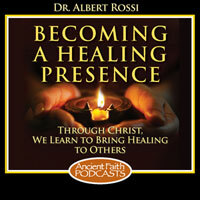 Dr. Albert Rossi: For today, I have the great honor and privilege of interviewing a friend of mine of long standing, Fr. Alexander Atty. Fr. Alexander Atty was Dean of St. Tikhon’s Seminary for about three years and pastor of St. Michael’s Antiochian Orthodox Parish in Louisville, Kentucky, for many, many years, and he and I go back years and years and years and years and years. I once gave a retreat for him in Louisville about ten years ago, and we’ll talk. A subtheme through the little conversation will be finding joy in suffering, because Fr. Alexander—right now we’re sitting at Antiochian Village in the chapel where it’s quiet; we’re both here for a wonderful wedding this afternoon—Fr. Alexander will go for chemotherapy tomorrow, so the theme is finding joy in suffering, living with suffering, because I need to hear it. And you know what? I think you who are listening need to hear it. Fr. Alexander, would you say a word to us about, well, for lack of better words, your current state of health and some of the things that go through your mind and some of the things that you’ve been through? Very Rev. Dr. Alexander Atty: Thank you, Dr. Rossi. Always a pleasure to see you. Our friendship does go back a long time. January of 2010 I was what I would call a healthy specimen. Had a wonderful parish, great family. Didn’t smoke, didn’t drink, did all the right things until I got a stomachache and they told me I had four to six weeks to live. Dr. Rossi: Oh! Like that. Like lightning from the sky. Fr. Alexander: It sort of was like lightning from the sky, but for some reason I never panicked. I always say to myself, and I say this before every service I did and every time I had to speak or preach, I always said, “Lord, I work for you. Give me the words so that I may speak intelligently and reach people.” It’s not necessarily about using [an] Oxford vocabulary, but it was always about reaching people and bringing people to Christ. Well, at that point when I was told this, I said, “Lord, I feel like I’ve served you as a priest. Maybe not the best; I know I could have always done better. I know you’ll help me through this.” And to this date, four years later, I’m living longer than they thought. The quality of life sometimes ebbs and flows. There’s days that death looks appealing, and then there’s days like today: it doesn’t look appealing. My one problem with my illness is: and I feel that I haven’t suffered enough. Dr. Rossi: Would you tell us what the diagnosis is? Fr. Alexander: I was diagnosed with fourth-stage colon cancer, which is the highest you can go in cancer. It perforated my colon. I had to have forty inches taken out. It spread to my abdomen, it spread to my liver, and as of recently it spread to my lungs. I have confidence in my physicians, but I really have more confidence in knowing how many people have prayed for me, which I felt like I didn’t deserve. I’m humbled by the numbers of people who say I’m in their bulletin; they pray for me all the time. There’s a number of people who were sad that I had to retire from St. Tikhon’s so early after only being there for two and a half years. But my health took a downward trend this year, and my doctors weren’t so confident in April. Because I had an infection, I couldn’t take chemo. While you’re on an infection, [you can’t take chemotherapy]; you can’t take it while you’re on antibiotics. And they basically said if I can’t get back on chemo, I might not finish the summer. Well, I got back on chemo, and, thanks be to the grace of God, I’m still here. And don’t think I don’t think I don’t question why I’m here. There’s days when I wake up and wonder why the Lord has kept me long. There were days I thought I was ready. I had so many confessions, and my spiritual father must have [gone] deaf hearing my confessions, because they were lengthy. I tried to turn every stone over, left no stone uncovered, because even when people think you’re a priest and they have a different view of priesthood than we have of our own priesthood. I’m a critic of my own priesthood. Most people think priests go to heaven automatically. I don’t know where they get that from; it’s not our theology. I see the priest being judged a little bit more sternly because of his knowledge of God and how he should be as a shepherd. A man who prays and molds people, brings people to Christ: that’s our job. The sickness has given me a sense of freedom. I feel free, like I was reading The Diary of a Russian Priest the other day, and the first sentence in the book, I believe, states, “Now I’m a priest I can speak freely.” Well, I always felt like all our priests should speak freely, but unfortunately we don’t. We’re worried about people calling the bishop or people calling the parish council, making lots of waves. We go our whole life that way. Well, I went my whole life that way until I was diagnosed, and then I said, “What’s the worst thing that could happen to me? I already have it.” So I became—not that I was ever dishonest—I became a little more honest. Not to hurt people’s feelings, but in the life of a priest, the window of preaching God’s word and bringing people to salvation is a very small window. Very little time we spend doing that. My illness has given me that opportunity, to try to preach the Gospel without words. Dr. Rossi: To be blunt, all I need to do is look at you, and I see the Gospel without words. I mean, this morning, Sunday, you presided. You didn’t preach, but I saw/heard the Gospel without words. So I’m a very grateful man just to be in your company; I’ve known you these many years. From my own memory, when I gave a retreat at your parish in Louisville ten years ago, at the end of the day, I was spent, as one would be. We had vespers in the little chapel, different building, smaller building, set apart from the main church. It happened to be snowing beautifully that evening, and the choir was radiant. That’s one of the memories of my life, foretaste of heaven, sitting in that very small, very beautiful, almost Mount Athos-like, I would suppose, place, with radiant vespers, heavenly singing, snow coming down, in your presence. Do you want to say just a word about that little chapel? Fr. Alexander: Yes, I had a spiritual father, Dr. Rossi, who was a monk from Mt. Athos. His name was Fr. Isaac. He died about six, seven years ago, and he did write a book about Elder Paisios that’s in print right now. I went to him because I heard he was an excellent spiritual guide. He was Lebanese by ancestry, which is my ancestry, and before I even was ordained, I got acquainted with him. Every other year, I went back to see him. He would tell me things that annoyed me, of course, but the truth hurts. I at one time was a very heavy guy, and he told me that a fat priest is no priest. Dr. Rossi: “A fat priest is no priest.” Mm. That’s what he said. Fr. Alexander: That’s what he said, and I asked him why he said that, because I was overweight, and he said, “Because if you can’t control you, you can’t help control others.” And some of the other things that he said to me—“God gave you a set of shoulders to carry you. You can’t carry others. You help them; you can’t carry them.”—little things like that stuck in my head. Well, it took ten years to build that chapel, because I didn’t want to make it a major issue and people voting, because people were not going to vote for their spiritual welfare. They’re going to vote for comfort, not spiritual challenges. So I raised the money without the vote. Took me ten years, but once it was built—and you should see it now: its beautiful icons, woodwork—it is an Athonite chapel, but it changed me, because I had daily services. I read the daily gospels. Thank God for that. But it changed my parishioners. We started growing rapidly once that building was in use. The medicine for the American Church… You know, I think the American Church is in serious trouble spiritually, because we don’t do enough church. If people would just realize how simple it is—the formula’s simple: you worship every day, you learn something every day, and you do something every day for Christ and his Church. An excellent book for that is Beauty for Ashes. Fr. Alexander: Metropolitan… I forget his name; forgive me. Fr. Alexander: Because I wrote him a letter. I was in love with his book, because it’s the recipe for church growth, and I followed that, and it was hard. It was very hard getting up at six o’clock in the morning to do a seven o’clock service by yourself, but I was never alone. People came. When they say, “Build it and they will come,” that’s not a joke, and that chapel has transformed many people, and the transformation of them brought other people to the faith, and it’s the recipe that the Orthodox Church always had that we had forgotten once we moved to this country. Dr. Albert Rossi: Thank you, Fr. Alexander, and I would say from my shoes that chapel, that one experience I had was one of the transformative experiences of my life. I’m also aware that this podcast is heard around the world. I get emails from Australia and so on, so I need to make sure I balance things. My opinion is that your spiritual father, Fr. Isaac, was absolutely right in his sentence to you, but I also would say I know priests who are overweight, grossly overweight, and obese for glandular problems, who live a disciplined life but still carry a lot of weight, so I wouldn’t want the listeners to this podcast to go judging priests by their weight. However, that doesn’t make the sentence untrue. Very Rev. Dr. Alexander Atty: You’re absolutely right, Doc. If you look at the gospels, there was one gospel where the guy did everything right: he fasted, he tithed, he did it all, worship. Christ gave him a prescription that was just for him: sell everything and give it to the poor. Well, my spiritual father gave me a prescription that was just for me. It wasn’t a reflection on any nun, priest, monk; it wasn’t. It was me. It was a personal Rx, just like Christ gave that young man in the gospel his own personal prescription. Dr. Albert Rossi: It was a personal Rx and, as I sit and talk to you now, the Rx worked! Very Rev. Dr. Alexander Atty: It worked. It did work. Dr. Albert Rossi: With that I will thank you, Fr. Alexander Atty.